Aljazeera – This year is likely to be the hottest on record, the UN’s weather agency has warned ahead of a global climate summit starting in Paris next week. Global average surface temperature in 2015 is expected “to reach the symbolic and significant milestone of 1C” above the pre-industrial 1880-1899 era, the World Meteorological Organization (WMO) said on Wednesday. The group said a combination of a strong El Nino and man-made global warming was behind the rise. The years 2011-2015 were also the warmest five-year period on record, with many extreme weather events – especially heatwaves – influenced by climate change, the WMO said. 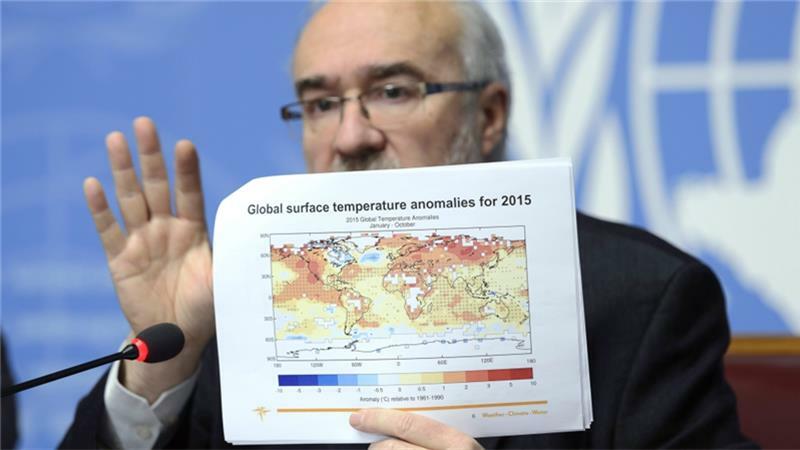 “This is all bad news for the planet,” said Michel Jarraud, director-general of WMO, warning that inaction on climate change could see global average temperatures rise by 6C or more.